DESCRIPTION The great curb appeal matches the interior of this Gold Seal green built home. This home has been SO VERY WELL TAKEN CARE OF that it looks new & is still trendy & up to date. Front entrance with covered front deck enters into the living room with fireplace. Then to an efficient kitchen & dining area. A big window & door lets you enjoy that backyard. Laundry & 2pc bath are also on the main floor. Upstairs is a generous master with 3 pc ensuite & walk in closet. 2 more bedrooms & full bath complete this level. The finished basement has another full bath, an office & family room. Single insulated garage (12x22) & double parking pad fulfills your parking needs. Your insurance bill will be reduced due to sprinkler & alarm systems. 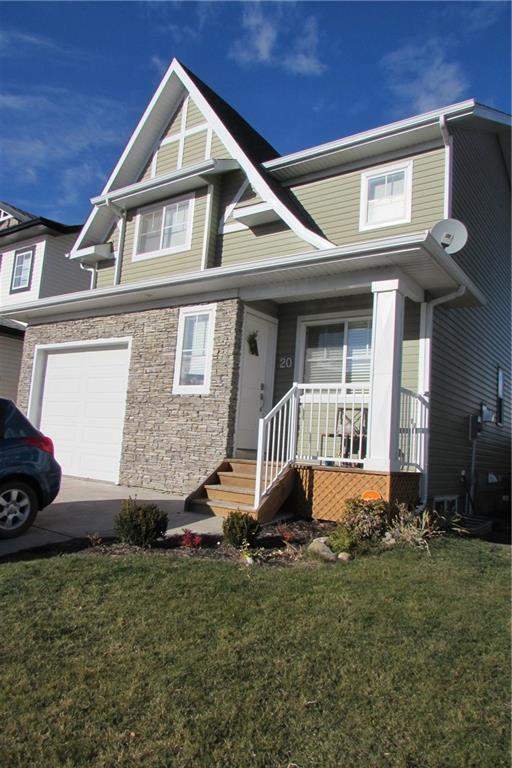 This is a great home with such an EFFICIENT USE OF SPACE in a friendly subdivision of Carstairs. The big yard is fenced except for west side & deck is large & partly covered. There is an OPEN FIELD BEHIND. This house has so much to offer & is much bigger than its 1328 sq ft. Wow!